❤INDUSTRY-LEADING BLUETOOTH 4.2: Advanced Bluetooth CSR 8635 chipset provides you a faster transmission and lower latency. Wireless range up to 10m(33ft). Enjoy skip-free phone call and music. Compatible with iPhone, iPad, Samsung Galaxy Series, Sony Xpeira,Google Nexus, Android Phones, Tablets and more. ❤LIGHTWEIGHT AND SWEATPROOF:Lightweight and compact, weighing only 1.3 oz, you don't even feel the presence of pressure on your ears. It's small and handy to hold. Foldable and automatic shrink cable design for anti-tangling. It is equipped with a durable box for easy storage. ❤Hands Free:The buttons on the right earmuff provide quick and intuitive control, which can control the power switch, the volume, control music, activate Siri, or connect hands-free calls. It's convenient, fast and simple, so you do not need to approach your equipment. ❤ Unmatched comfort and secure Fit:The ergonomic design ensures your headphones stay comfortably firm in place all day long. 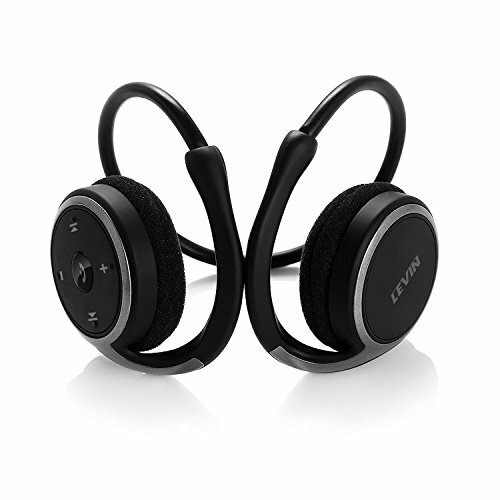 The unique behind-the-head design allows headphones to fit your ears securely, giving you more support and stability, even during running, fitness or general exercise, there is no need to worry about falling off.